Kuwait's al-Rai daily says Lebanon-based group, Syrian army have created a joint military command, dividing potential war fronts. The Lebanon-based Shi'ite militant group Hezbollah and the Syrian army have initiated a significant military cooperation in joint preparation for the possibility of a future armed conflict with Israel, the Kuwaiti daily al-Rai reported on Monday. The report came as Syrian president Bashar Assad urged Lebanon's Prime Minister Saad Hariri earlier Monday to support Hezbollah and maintain calm in the divided country. Speaking with al-Rai Monday, sources have indicated that Hezbollah and Syria have formed a joint headquarters meant to orchestrate the cooperation between the two forces, which is to be commanded by two officers – one from the Syrian military and one from Hezbollah. The joint command, the report said, would ensure full cooperation in land, sea, and air warfare, as well as take care of the positioning of anti-aircraft missiles in both Lebanon and Syria in order to confront the possibility of an Israeli nuclear assault. Recent exchanges between the two organizations reportedly included trading information regarding strategic sites within Israel, including airports and other facilities, as well as dividing up the prospective war fronts between themselves. The report also stated that Damascus and Hezbollah also worked together on the possibility of joint artillery strike against Israel, as well as drawing up a collective plan for the defense of vital Lebanon, Syria sites in case of an Israeli attack. The two organizations also reportedly shared information gather by Hezbollah following the Second Lebanon War in 2006, including military conclusions and tactics. The al-Rai report also stated Syria's contentment with Turkey's recent announcement that it would ban Israeli warplanes from entering its airspace, since it prevents the possibility of an Israeli airstrike from that direction. 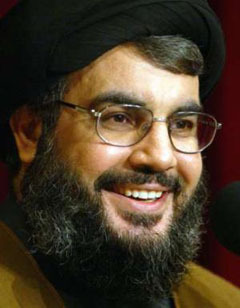 Earlier Monday, Syria's Assad urged Lebanon's leader to support Hezbollah and maintain calm in the country. The two leaders met in Damascus for a pre-dawn meal called suhour, the last meal before the daytime fast resumes for the holy month of Ramadan, the Syrian state-run news agency reported. Hariri has visited Damascus repeatedly this year in a sign of Syria's renewed influence over Lebanon in the years since Damascus withdrew its military in 2005, ending a nearly three-decade hold on Lebanon. Hariri's visits indicate that he needs Syrian support as his Western-backed coalition struggles at home. Syria backs the Lebanese militant group Hezbollah, which has a large role in Lebanon's fragile national unity government. Last week, street battles in Beirut between the Shiite militant Hezbollah and a small Sunni group killed three people, exacerbating sectarian tensions in Lebanon. Later Monday, Hariri was expected to head the first meeting of a new committee formed to discuss ways of ridding the Lebanese capital of weapons. Also Monday, Iranian ISNA news agency quoted Iranian President Mahmoud Ahmadinejad as saying that Lebanon's resistance groups, along with Iran must stand together to thwart what he called foreign aggressors, adding that such an alliance would work against the "enemies of humanity." "Enemies are endeavoring to damage Lebanon's solidarity and unity, but Lebanese' resistance groups will thwart their plots and conspiracies with their tact and promotion of solidarity," the Iranian president added. Nearly 600 Israelis have signed up for a campaign of civil disobedience, vowing to risk jail to smuggle Palestinian women and children into Israel for a brief taste of life outside the occupied West Bank. The Israelis say they have been inspired by the example of Ilana Hammerman, a writer who is threatened with prosecution after publishing an article in which she admitted breaking the law to bring three Palestinian teenagers into Israel for a day out. Ms Hammerman said she wanted to give the young women, who had never left the West Bank, “some fun” and a chance to see the Mediterranean for the first time. Her story has shocked many Israelis and led to a police investigation after right-wing groups called for her to be tried for security offences. It is illegal to transport Palestinians through checkpoints into Israel without a permit, which few can obtain. If tried and found guilty, Ms Hammerman could be fined and face up to two years in jail. But Israelis joining the campaign say they will not be put off by threats of imprisonment. Last month, a group of 11 Israeli women joined Ms Hammerman in repeating her act of civil disobedience, driving a dozen Palestinian women and four children, including a baby, through a checkpoint into Israel. The Israeli women say they are planning mass “smugglings” of Palestinians into Israel over the coming weeks. “The Palestinians who join us are mainly looking to have a good time after years of confinement under the occupation, but for us what is most important is our act of defiance,” said Ofra Lyth, who helped establish an online forum of supporters after attending a speech by Ms Hammerman. “We want to overturn this immoral law that gives rights to Jews to move freely around while keeping Palestinians imprisoned in their towns and villages,” she said, referring to regulations that bar most Palestinians in the occupied territories from entering Israel, and Israelis from assisting them. Exceptions are made for Palestinians with permits, sometimes issued for a medical emergency or to some labourers with security clearance. For the Palestinian women, though, it is not about making a statement or defying an unjust law, said Ms Lyth. For Palestinians in the West Bank, it is not often easy to breathe. The territory is home to a growing population of 300,000 Jews in more than 100 settlements. The settlers are able to drive into Israel on roads that the army oversees with checkpoints. It was through one such settler crossing, near Beitar Ilit, south of Jerusalem, that Ms Hammerman took the three Palestinian teenagers this year. For their protection, she has not identifed the young women or the West Bank village where they live. She refers to the women as Aya, Lin and Yasmin. They, too, could face jail for breaking the law. In Ms Hammerman’s article, published in the Haaretz newspaper in May, she admitted that she was aware her actions were illegal. She told the women, who were 18 and 19, to take off their hijabs for the day and dress in western-style clothes to avoid attracting attention from soldiers at the checkpoint. She also taught them an easy Hebrew phrase -- Hakull beseder, or “Everything is okay” -- in case a soldier spoke to them. She then took them on a tour of Tel Aviv, visiting the city’s university, a museum, a shopping mall and the beach, which she noted none of them had ever seen even though it is only about 40km from their village. Gisha, an Israeli human rights group, said Israel introduced a permit system to limit Palestinian movement out of the West Bank in the early 1990s – about the time the young women were born. Ms Hammerman wrote that the only dangerous moment during the trip was when a plain-clothes policeman stopped them and asked for the women’s identity cards. Ms Hammerman lied to the officer, telling him that the women were Palestinians from East Jerusalem and therefore entitled to enter Israel. In June, Yehuda Weinstein, the attorney general, was reported to have approved a police investigation of Ms Hammerman after a settler organisation, the Legal Forum for the Land of Israel, complained. The ranks of Ms Hammerman’s supporters have swollen since the group placed an advertisement, titled “We refuse to obey”, in Haaretz this month. The ad said the group was “acting in the spirit of Martin Luther King”, the US civil rights leader, and demanded that Palestinians be treated as “human beings, not terrorists”. Over the past week, the online forum has attracted more than 590 Israelis signing up to repeat Ms Hammerman’s act of civil disobedience. Still, the coverage of Ms Hammerman and her supporters in the Israeli media has been largely hostile. During a television interview last week, she was accused of endangering Israelis with her trips. The show’s host, Yaron London, asked whether she had inspected the Palestinian women’s underclothes for explosives before allowing them into her car. She will will not be deterred, though. She said the group had discussed future trips for Palestinians, including taking them to pray at al-Aqsa, the mosque in Jerusalem that has been inaccessible to most Palestinians for at least a decade, and visits to Palestinian relatives they cannot see in Jerusalem and Israel. She said her immediate goal was to kick-start a discussion among Israelis about the legality and morality of Israel’s laws and challenge the public’s “blind obedience” to authority. Ms Lyth added that the Palestinian women “who have gone on our trips are the heroes of their village. They and their families know they are taking a big risk in breaking the law, but harassment is part of their daily lives anyway”. The speech delivered by Hezbollah Secretary General Sayyed Hassan Nasrallah on Tuesday August 24, 2010 during an Iftar banquet organized by the Women's body in the Islamic Resistance Support Organization at Al Kawthar School. ….Our responsibility in Lebanon is that our country be strong, our nation be strong and our people be strong. We must seek to possess the elements of power to survive in the present and to remain in the future a prideful, honorable, free and sovereign country. This can't be achieved unless we possessed the elements of power. In Lebanon, we are a country and a people who, within our capacities and circumstances, face many internal and external national and religious challenges and difficulties. Our responsibility, whether we are Muslims or Christians, is to overcome these difficulties, not to fear them or to surrender to them. We rather have to confront them and overcome them and achieve victory in facing whatever challenges so as to protect our country, fortify it, better its situation and develop it on every level. This is a collective responsibility. No one may elude this responsibility whether in confronting external challenges or in facing internal difficulties. This can't be achieved or realized except with loyalty, knowledge, education, unity, cooperation, specifying priorities, correct plotting and making use of all the available human and material capacities in our nation which is rich on the human level though humble on the material level. However, when the human richness is available, man may – when trusting Allah Al Mighty and with faith, knowledge, education, diligence and loyalty – make wonders. Among the external risks we in Lebanon are facing is the Israeli risk: Israeli ambitions, the Zionist project and Israeli greed for our land, water and welfare. In the past we used to say Israel's greed for our land and water. Now according to experts, we say our land, water, oil and gas on which we differ and which are not yet dug out. However these are no doubt among the challenges we are facing. In fact, if in the future it was verified that in Lebanon there are oil and gas and the like and it was made clear that there are common wells or disagreement over the maritime borders with occupied Palestine – as we do not acknowledge Israel – that will pose a problem. If we were weak in Lebanon and we could not secure our right, we will face such a challenge. It's our fate in this beautiful country – Allah's trial, examination and tribulation to us - that in a neighboring country which is Occupied Palestine (Our neighboring country is Palestine and not Israel) an entity which is based from the very first day on aggression, killing, terrorism, usurping and massacres was erected. We then have to confront its risk and greed. After all these long years, we in Lebanon piled a very rich experience in how a small country may defend itself. This experience is not limited to Lebanon. It is a general idea. How a small country with limited human and material capabilities may defend its existence and sovereignty and restore its lands from a strong entity which is supported by all the strong forces in the world and which possesses the strongest amy in the Middle East? How is that possible? We in Lebanon possess by now a rich political, military, security, popular, social and jihadi experience in this perspective. This experience was made in Lebanon. It could restore the land and the detainees. It could achieve the balance of fear and deterrence with this enemy. It could make this enemy think a thousand times before staging an aggression against this country. This experience is now being discussed and taught in the greatest universities and strategic studies centers in the world. This experience was written by the blood, tears and sweat of your children – the Lebanese young men. This experience is today the richest experience. We do not need to go and study the experiences in Switzerland, France, America, China or Russia. Now the world has come to study July 2006 War and to study and benefit from the Resistance Victory experience in July War. This experience might have been based on a balance which did not have a clear definition or terms in the past years and decades. However in the recent years it gained its clear definition and terms. You know the Lebanese are good in making definitions: the army-people-resistance balance. Indeed this is a new, exclusive and special balance which worked successfully in Lebanon and could achieve what it did achieve. We are supposed to preserve this balance and prompt and tighten the elements of this balance as well as its strong and powerful interrelations. Hereof I usher to the first point which is equipping the army. We in Lebanon at times say we agree unanimously on one topic while in fact we won't be as such. That's because at times when we talk, it would be something while our true convictions and commitments as Lebanese political forces would be something else. Well we say that we unanimously agree on prompting, strengthening and equipping the Army. Following Adeisseh incident which had many significances – some of which we tackled then, equipping the army was evoked again. Adeisseh incident revealed a very important point concerning equipping the army. It has to do with the arms given by the Americans to the Army and to the security forces. Now if it is verified that the Americans had set a clear and open condition, that would have been a mistake. No such conditions must have been accepted though I do not see such a condition. The Americans suppose that the weapons they have been giving to the Lebanese Army are not being given to fight Israel or to defend Lebanon in any confrontation with Israel. These weapons are rather meant for internal purposes and considerations they call ‘fighting terrorism.’ So if they want to use mild terms they say fighting terrorism. This was revealed after Adeisseh incident and when argument started in the US Congress and between the Congress and the Pentagon and the US State Department: Shall we stop this support and these weapons grants or not? Even some Congress members demanded an inquiry over the weapons used by the Lebanese Army in Adeisseh to know whether these weapons used were American weapons or not. To this extent the argument reached. Indeed, the conclusion they will reach is that they will continue to provide weapons. However do you know under what pretext? We have no problem even if we were the pretext. What's important is that the army be equipped. The pretext which was mentioned by the Congress, the Pentagon and the US State Department is that to carry on with our hegemony over Lebanon, to have Lebanon in our grip, to confront future risks and to be able to confront Hezbollah (They mentioned Hezbollah in particular), we must make the army strong and we must arm it. We must not stop arming it because stopping that means that Lebanon will fall in the hands of Hezbollah. Therefore, we are doing Lebanon a good favor whether it comes to the friend or the foe. So if you do not want to equip the army against Israel and suppose there is not Hezbollah, how would you behave? Even on the economic level, a year before the martyrdom of PM Rafiq Hariri and on the wake of a demonstration for laborers that took place in Hey Asselum and during which clashes took place and martyrs fell, it was said that there is a social movement demanding toppling the government. Then I met with martyr MP Rafiq Hariri which led to a series of several meetings. He mentioned a point to me after I expressed my fear over the deterioration of the economic situation in Lebanon. I was surprised with his answer. He told me no there won't be a collapse. I asked him: Is that due to the government's economic policies? He told me that helps but that is not the main factor. He told me: The world will not allow the economic situation to collapse in Lebanon. The world does not allow us to develop and does not address our crises and cover for our debt but it does not allow us to fall. I told him why this concern is for. He told me that the international evaluation says that if the economic situation collapsed in Lebanon, we will be hurling Lebanon in the hands of Hezbollah. So it's because of you the deterioration of the economic situation in Lebanon will not be allowed. I told him: We accept that then. This is an aggressive negative outlook that Hezbollah is a group which we must fear from on Lebanon. They are not afraid from Israel on Lebanon. However because we are afraid of Hezbollah on Lebanon, let's equip the army and preserve the stability of the economic status and prevent a collapse because the collapse will lead to such and such. Anyway this has been made clear following Adeisseh incident. I would like to tell you something. As for Ghajar, international efforts are multiplying to persuade the Israeli enemy to withdraw from the occupied Lebanese part of Ghajar because it is indisputable – i.e. there is no disagreement over that being Lebanese and Israel acknowledges that it's a Lebanese part. The issue differed from that of Sheba Farms and Kafar Shuba which the Israeli enemy considers as territories attached to Israel and annexed to Israel or to Syria but not to Lebanon. So all international efforts are trying to persuade Israel to pull out from Al Ghajar and the evidence used does not have to do with morals or the international law or with the logic that says that it's a Lebanese land which must be restored to its owners and the presence in it is an illegal illegitimate occupation that disagrees with the international resolutions… They rather call on the Israelis to pull out from Al Ghajar and sell it to the government in Lebanon because that weakens the logic of Hezbollah and the Resistance. I tell them that Israel will not pull out of Al Ghajar except because there is a resistance in Lebanon, even if we are not engaged in an armed fight in Sheba Farms. If one day they pulled out from Sheba Farms that will be because there is a Resistance. As for the consensus, yes we all call for equipping the army. There are several options the first of which is settling on the purchase balance and then purchasing the arms. That would be costly because the government will say where we will get money from. We have no resources. Let's add taxes and people can't tolerate more taxes. Then we will be stuck in the very vicious circle. Second there is the option of grants and this is what His Eminence the President called for. After all this is a good idea but as it was said and as the President himself said and as General Aoun – who is an expert and a former Army leader who knows the formation of the army and its needs - and as others said too and I do agree with them: popular donations do not equip an army. I will be frank with you. Months ago I had a meeting with the brothers and sisters in the Islamic Resistance Support Organization. I told them all the donations which the Resistance Support Organization gathers and which are offered by others can not arm the Resistance or meet its needs. However the value of these donations to us is moral and emotional on the first level. That means that a door is open for those who can't fight but may help in offering money. So the money and the donations which are collected can not equip the Resistance and for sure can not equip an army but it is a good and recommended step. Now there is a very national choice and today I call on our ministers in the government to evoke this issue when suitable on the government. Well we have brothers and friends. There are many Arab nations. All Arab nations say they love Lebanon, are concerned about Lebanon and support Lebanon. There are also many friendly nations in the world. Let's start with those close to us as: Those next of kin are more deserving of our kindness. I suggest that after the concerned side in the state - whether the government or the Supreme Defense Council (This is a legal issue) - determines the quality and quantity of weapons the Lebanese Army needs, a decision would be taken by the government that we want to get these weapons. Then ministers would be charged and delegations would be formed and dispatched to the Arab states. We would tell them we do not need money. Instead of money we want weapons. You possess piled stocks of weapons and rockets which will be rust out. Well we have an army on the borders defending its country. We want to equip this army. Why don't you give us weapons instead of money? What do you have? If you have missiles, anti-tanks arms, aerial defense arms, rockets and tanks, give us of what you have what we may benefit from. They would decide the needs pursuant to the visions of how Lebanon wants its army to be and how will this army fight. This step might be taken. This can be done without 2011 budget. We do not need to make a law for this project. We are in an exceptional situation and the region is tense. Well Adeisseh confrontation in fact is by far more dangerous than the capturing of two soldiers on the borders. The person who was killed on the Israeli side is a head of a battalion, and a head of a brigade was also wounded. There were martyrs on the Lebanese side. In Keryat Shmona, settlers did not go to shelters. They rather took the buses and fled. They thought that compared to kidnapping to soldiers, this incident must cause a war to break out. This is not our point of discussion now anyway. We are in a country which is in a tense situation. Consequently, such issues can't tolerate researches and studies or waiting for one, two, three or four years. The army decides within its vision the quality and quantity of weapons needed and goes to the Arab countries. We would start with the Arab nations. Let's keep Iran to the end so that no one would feel frightened. We would go to the Arab nations and tell them you are our Arab brothers, and we are an Arab nation and a member in the Arab League. Your donations are welcome. We must gain something from them. As for Iran which has been evoked these days, you still remember that a year and a half ago and during the preparations for the parliamentary elections, I evoked this issue. It was then said that if the Opposition won the elections and formed the government, the countries which are equipping the Army will stop doing so. I then said we may resort to our friends in Iran and Syria. Uproar followed because we are in a country which has political divisions. Because of political divisions, whatever we say whether right or wrong is not accepted by the other party. Maybe we as well do not accept what the other party says. Only Allah knows. So there is a problem which is political division in this country. But now that is over. There is no problem now. We accept arms from Iran without any condition. In fact, Iran does not have any condition. The issue of Iran was evoked anew. We also call on the Lebanese government to take a decision of calling for Iranian support and aid. There is no problem in that. As we reported for you on the enemies; we reported for you on the Americans. Now we want to report for you on the friends. I pledge - and our brethren ministers will deliver this pledge officially – that Hezbollah will work on this and will invest all its Iranian friendships so that Iran might help in equipping the Lebanese Army as much as it can. I am not talking about purchasing weapons. It's possible to purchase arms from any country. I am rather talking about grants. I believe that needs an official demand from the government to this effect in a specified and not in a general - way such as telling our brethrens in Iran that this is our view and these are our circumstances and we need such and such grants and we welcome whatever grants you offer. Anyway, Iranian President Ahmadi Nejad will visit Lebanon on head of a ministerial delegation. Then the issue might be presented during the Lebanese-Iranian meeting and a delegation might be dispatched to Iran. I believe that the Islamic Republic in Iran which has been helping Lebanon over the past 28 years since the Israeli invasion of Lebanon in 1982 will not refrain from granting the Lebanese army any kind of possible help. This is my conviction, and this is something which we must achieve together Inshallah. Concerning the following point, I would like to tackle the issue of spies in a couple of words. We currently suppose - and it is right to suppose - that Lebanon is engaged in a daily security war with the Israeli enemy. I said in the latest ceremony, that there are more than 100 spies. The concerned official ministries said that the number is more than 150. In the past couple of days, more collaborators were also arrested. It is right to suppose that we are engaged in a true security war with the Israeli enemy. Efforts must be continuously exerted to reveal spies and that is taking place. Juridical follow up is necessary. Death penalties are issued but practically that will be referred to the Supreme Court. There it might take six month, a year or two. Only Allah knows. Some political leaders in Lebanon called for forming field courts. If we do not want to transgress justice and make changes and new field courts, I call on the Lebanese justice to act in an extraordinary way apart from the routine. When a country is in a state of war, it issues an emergency law or acts in an extraordinary way. Cases are referred to the Supreme Court as natural but with extraordinary vigor and activeness and not in a routine way that takes much time. Our aim is not revenge at all. We rather believe that ushering in executing death penalties against some spies whom death penalties have been issued against will stop or influence to a great degree the collaboration of spies with the Israeli enemy. We do not want to avenge. We want to halt this descend and transgression. Many spies started collaborating after 2005 and 2006. That is made clear from the files. True there are old collaborators; but there are many new spies, who started collaboration two or three or four or five years ago, and the door is still open and recruiting is still taking place. What will make people deter or not respond with recruiting? It is executing death penalties. So it is not revenge. "In the Law of Equality there is Life to you, O ye men of understanding." This is Allah's line of conduct with humanity all through history. In that the community revives. It's not a punishment that destroys everyone. I call for a state of judicial emergency. On this perspective and on the spies issue also, the spy harms himself. We must free the families from any harm. The father, mother, wife, sons and daughters have no sin. Well I am known, and those who know me closely know that I am emotional. Even as far as martyrs are concerned, my brethrens remember and in some occasions I said that when they used to tell me that some of our men were martyred… So and so martyr fell in the Resistance operation, the first question I used to ask: Is he married or single? Does he have children or not? Are his mother and father alive or dead? So for the first impression when a martyr used to fall, as an emotional human being, the first idea that comes to your mind is those concerned in the catastrophe: the father, the mother, the wife and the children. In fact as far as the collaborators are concerned, this is a negative fall. I start thinking of the father, the mother, the wife, and the children; and among the children I care most for the daughters. So in the country, city, neighborhood, university and school they will be referred to as the children of the collaborator or the daughters of the collaborator. This is a harmful deed that must not be perpetrated by anyone because it at times has negative and dangerous moral, social, and psychological impressions. So we must be sure that the one who assumes the responsibility of the wrong deed and the sin is the spy and the spy only. No one must have a negative view on his family besides his political party or movement or the institution he belongs to. Also in the political frameworks, there are institutions in which spies were discovered: generals and colonels in the army were revealed to be spies. So will the Army be in the circle of accusation? No. Anyway, you know that this was our logic as far as this issue is concerned. The collaborator is the one to assume the responsibility. Finally I want to answer a question or an argument. I found in the past few days that some insist that all the Lebanese parties might be infiltrated and that Hezbollah is indeed infiltrated. I don't insist stubbornly. I will tell you why Hezbollah is different. In Hezbollah, there is the organizational structure and the popular masses. We have no files for the popular masses: those who love, back and support us, and those who attend our ceremonies and procession and vote for us in municipal and general elections. These are our masses. We have no files for them and consequently they might be infiltrated. I always used to talk about the organizational structure because in the organizational structure every one has a file. The difference between Hezbollah and the other Lebanese parties is that since Hezbollah carried on in the resistance and was engaged in daily fighting with the Israelis and was the most targeted by the Israelis and because the Israelis worked industriously to infiltrate our lines to know where our arsenals are, where our military centers and leaderships are and what our plots, intentions and tactics are, the Israelis were interested in infiltrating us more than any other party or forces. We were thus more concerned in preventing this infiltration. This is why over the past 28 years, Hezbollah's organization has been comprising an anti-spying body. It is a large and not a small body. Its whole occupation all day and night long is to prevent infiltrating this organization. I claim that it is the strongest anti-spying body in Lebanon at least. I do not want to exaggerate and say on the level of the region. I have illustrated in a previous press conference that any person who wants to get enrolled in the organizational structure would be subject to a number of interrogations, procedures and examinations even if he was the son of Hezbollah Secretary General. Let him be whoever he is, he must be subject to these examinations. So when I say we are not being infiltrated so far I won't be insisting stubbornly. I am building my word on scientific objective data and a long experience. Our body is immune. Indeed we do not claim infallibility; we rather claim that our body is immune. Despite my clarification, some still insist one what one of the Lebanese apparatuses mentioned on providing us with data on three brethrens who are collaborators. Some still insist on that though I answered you and here I am stressing on that again. Anyway we are preparing for a press conference - but on a slow pace because no one is purchasing us with the rod - in which we will discuss this issue in a technical way and experts will assume the argument. That's because the pillar on which some base their accusation to some of our brethrens is collaboration. It is something that has to do with telecommunication. All of this issue is for discussion, clarification and illustration so that we give our evidences and proofs. It's due time will come maybe after the Eid and after the month of Ramadan. It will be due time to tackle several topics and this is among the topics which are pulled off. But tonight and as we are the guests of the banquet of the Resistance, I want to stress that was the Resistance not immune it would not have gained victory in July War. One of the most important elements and reasons of the victory of the Resistance in July War is that it is immune. The enemy bombed everywhere but the rocket stands, rocket stockpiles, the infrastructure of the Resistance, the telecoms of the Resistance and many others remained intact because the Israelis had no data or information on them. The third issue is false witnesses. In a couple of words I say: We evoked this issue in the government and the government called on the Justice Minister to make a study on this topic and on the ways to approach this file. Here I want to clarify so that no one make exaggerations and say the government will take a decision to summon the false witnesses and will reveal those involved and the fabricators and will try and hold them accountable. That did not take place. Consequently, here comes the issue of separating authorities. The government did not take such an issue. All what the government did and which is a good step is that it called on the Justice Minister to make it a favor and present a legal study and a group of ideas on how to approach this topic. Why? That's because it is a legal case. Yesterday, the spokeswoman for the Special Tribunal for Lebanon said that the STL was not concerned with the false witnesses and we find this odd. I do not want to argue with the STL though that is odd. The false witnesses have deluded the STL for four years. Still the STL says it is not concerned in that. Anyway this is a legal, moral and juristic debate over the truth and the justice and discussing it will be due later. So if the STL says that is not among its competences, we come to the Lebanese judiciary which says that it has a letter from the STL on that being not among the competences of the Lebanese judiciary. Has the Lebanese judiciary and Lebanon become under the jurisdiction and the mandate of the STL so it specifies its competences? The Tribunal says the false witnesses are not among its competences and then says this is not among the competences of the Lebanese judiciary! Whose competence it is then? If that is not among anyone's competence, that means that everyone who was oppressed by the false witnesses and those who fabricated them are tantamount to the law of the jungle. So let those who were oppressed seek justice because there is not any side competent to assume that. This is very dangerous on the country. The question must be asked and the government must answer the question of how to approach this topic. Indeed attempts are taking place in the meantime to go into an argument over definitions: false witnesses, witnesses of fabrications and fabricators. Whatever change came over the names, the truth remains one. Some persons have misled the investigation. Call them fabricators or false witnesses or whatsoever; some persons have misled the investigation. Someone has fabricated them. The former party might have got them or the latter party might have offered their services first. Some have held their grip and taught them and told them to go to the international investigation and say such and such. Go to the Lebanese judiciary and say such and such. The day might come when we will say everything because in the battle such day might come when we might say what might have crossed the minds of people and what might not have crossed their minds. Some have fabricated them and taught them? Who are they? Why do some in Lebanon want to keep things covert as Zuheir Essedeeq is kept overt abroad? Why do they want to keep those in the darkness? In the interview I said that if you do not want to hold anyone accountable, do not do that. On the contrary if you want to reward the false witnesses it is up to you. But at least for the sake of truth and for the sake of justice, all the Lebanese must know who fabricated the false witnesses and misled the investigation for four years. This is a national right. Our call for that will remain high ever until the Lebanese gain this right. Anyway we are following up with this case and the government says that it took a decision to study and approach this case. That is good then. Let's see what the Justice Minister will bring to the country and then we will talk accordingly. The following point has to do with the indications offered to the STL. I have held a press conference in which I offered a group of evidences, data and information. See this is the problem with objectivity in the country. I did not offer conclusive evidences. Have I offered conclusive evidences the country would have been tumbled down. Well I said I offered indications and data that open horizons for the investigation. Many of those who made their comments said we did not offer conclusive evidences. What have they discovered then? I am sure that they do not hear or follow up. Some people and journalists in Lebanon and outside Lebanon receive short messages (sms) which dictate on them to say such and such. They would not have read or heard anything. This is one of the great problems in the country. That's why I used to say we must listen to each other and read for each other and understand each other. I remember that three days before the tripartite summit we started expressing a stance on the STL and the indictment. Then the tripartite summit took place in Baabda. We agreed on calmness and on addressing issues. I said we have some data. Some showed up to say: Good. You do not acknowledge the STL. Present these indications to the Lebanese judiciary then. I said if the government asked that from us we are ready to present what we have to the Lebanese judiciary. Actually the PM asked that. We offered our data to the Lebanese judiciary. The sms popped anew and generalize one idea to all the politicians in the other party. If you open the newspapers you will notice them one after the other giving their comments. The same is seen in the various websites: Handling the indications and the data to the Lebanese judiciary is an acknowledgement of the STL. So as if one is fooling the other. Well you told me to give them to the Lebanese judiciary. I gave them to the Lebanese judiciary and said I have nothing to do with the international investigation. Then in no time you tell me that handing the indications and data to the Lebanese judiciary is an acknowledgement of the STL. Well I say again I will not be persuaded now to say what I have concerning the STL and the international investigation. But the course of things says no; that is not an acknowledgement and I am not concerned with the STL and the international investigation. I will give my reasons and my evidences in due time Inshallah. Yes if the Lebanese judiciary wants us to cooperate and to carry on together, we are ready to cooperate and to carry on together. Primarily, a considerable amount of the given which I resorted to is available with the Lebanese state, the Lebanese judiciary and the Lebanese security apparatuses. We called on the Lebanese judiciary again: open the investigation with the collaborators. Well when a collaborator says in 2006 I brought in an Israeli commando to the Lebanese territories. They remained for several weeks then I brought them out of the country. Well did any of the Lebanese – from among the seekers of the truth and justice - take pains to investigate with this collaborator and ask him whether he remembers when did he brought them in or when he brought them out to see during these two or three weeks in which they remained in the Lebanese territories who was assassinated or what took place. Did anyone bother to ask him this question so far? Again it is you and not I who have this data. I reiterate you have this data and not I. Open the files and read with scrutiny. The following point has to do with electricity and water. As for the Resistance, the STL, the investigation, war and the struggle with the Israeli enemy, I am as fluent as you notice. Now when tackling electricity and water, I want you to have patience on me a little because this is a field of specialty. However I want to approach the issue from a general perspective as a show of cooperation. There is a true crisis in the country namely electricity and currently we were foretold that the country is heading towards a water crisis. I will tackle electricity with a couple of words and water with a couple of words and then wrap up. First there is a true crisis. Second this crisis is not new. Third the current minister must not be held responsible for this crisis (Nor the former minister because he was from Hezbollah). Let no one say I am defending my allies. After all, there is a general track, situations, events, administrations… I do not want to hold anyone responsible. There is a crisis now prevailing - namely the electricity crisis in the country. What even mounted to the crisis are the climate and the hot weather Lebanon was subject to. Anyway this crisis exists in countries with regimes and governments, countries which are stable and countries with great budgets. First I have read in some news papers and it has been said in councils that some of the protests that have taken place recently in some regions were politically motivated. As to my knowledge, no one has political motives. In fact no political side whether from the Opposition or from the Loyalists was by any means behind what took place in some streets. This is first. Some patient enduring people believe that if we hit the streets or not or whether we burnt wheels or not will not solve the problems. Some people can not endure. They believe that if they hit the streets and set wheels on fire, they could discharge their anger and may form a lobby. So no political side whether Hezbollah or Amal Movement or any party in the Opposition and as to my knowledge none of the parties in the other side stand behind what is taking place in some streets. Let's then cancel politics. It was also said – and that is funny – that what took place is a tryout. It is a maneuver held by one of the political sides – they mean us by that – to topple the government. So this is a ready made tryout for that. Allow me to say this is nonsense. First, today everyone has taken a decision that we want to carry on with this government, to cooperate and to address the problems of the people and the crises they suffer from. Second, at any time the Opposition wants to topple the government, it does not need to hit the street. It may topple the government in the parliament. It does not need to hit the street then. I'm telling you so because what is said is nonsense. Third, I want to go to what is even worse. In the past, when we used to have a political conflict with the government which was called the amputated government, we hit the street and made the first massive demonstration and the second massive demonstration for the Opposition. We made a sit-in then. I am one of the people who say we are clear and transparent. When we have a position on the government, we announce it openly and in daylight. We do not hide behind the bread of the hungry, the thirst of the thirsty, the need of the needy and behind power offs. We are clear and transparent and brave enough to express whatever political convictions and political decisions we have. We do not need this tryout and scenario by any means. On the contrary and after all the game of democracy exists in the country. Suppose we or the other sides in the Opposition realized that after all this government has become unable and futile. I pledge to contact the Premier and he will be the first person to say that well brothers we reached a conviction that we are not able to carry on together with this government. So we do not need a tryout or anything of this sort. They know we do not need a tryout for a demonstration on electricity or water or other social or labor demands. So put politicization aside. No one wants to topple the government. No one is targeting the government and no one is targeting the Energy Minister who is my friend by the way and for sure no one is targeting him. Well there is a crisis in the country. Let's see how we may address it. Well, the Cabinet endorsed a four-year plan. Great! We have to work for four years. Indeed that needs serious work and funding. It's not enough to take a decision. But there is something else demanded now from the government. The case deserves that, and some political leaders have called for an extraordinary meeting for the government to discuss electricity. So it is an emergency state. We can take steps. We might hire several ships which might produce for us energy and solve a part of the problem. Let's take this step then. Whatever the costs of this extraordinary procedure is it will be less than the costs the country is bearing now financially, economically, psychologically and on the health level. Consider the crises factories, butcheries, bakeries and restaurants are facing. Consequently the costs will be less. I add my voice to those who call on the Lebanese government saying the issue deserves forming a committee or having an extraordinary meeting. The view of the Energy Minister would be endorsed. Other ideas might also be presented on how to pass this summer with the least crises and without troubles. On the contrary, I address those who accuse us: We are concerned more than you over what takes place from time to time in the streets. The story is not that of discipline or haphazard action. We are afraid in some regions some people might be open to some intelligence sides that might push towards clashes between the people and the army or between the people and the security forces. This harms us all especially the Resistance. Here we have two demands: The first demand is from the government. The case deserves that the government meets and sets a framework and sees what ideas might be presented. All of us would unite and collect an extraordinary funding. Loans might be given. Let it be an emergency temporary solution because the situation is difficult. Second we have a demand on the people. I call on people to show patience, calmness, tolerance and discipline and not to be persuaded by calls to hit the street because that is fruitless. If what is demanded is that a certain message be conveyed, well it has been conveyed. If those people were supposed to press on the government, I believe the pressure which has been exerted is enough and more pressure will not lead anywhere. Almost always it's the people who are harmed when you block the roads and the like. With all due love, I call on the people in every region to cooperate and be patient because the situation is critical. We fear that someone would infiltrate such protests which might have a spontaneous and natural background and take the country to undesired consequences. However besides the extraordinary address, the endorsed plan must be worked on seriously. It must be funded and aided as possible. The last section has to do with water. Perhaps we are not able to address the electricity crisis – though we are concerned to address the electricity crisis as a country. Well in the past few days, much was said about Busheher nuclear plant. The cost to build the nuclear plant of Busheher which will provide a great amount of Iran's energy is far less than what Lebanon has so far spent on the electricity sector. I will not mention figures because that needs precise data. But the cost is less than the billions of dollars Lebanon has so far spent on the electricity sector. Let's learn from the Iranians who are our friends. Iran has oil, gas and various other energy resources. Still what does the leadership in Iran say? It says that after 20, 30 or 40 years when oil and gas are used up how are we to provide people with electricity? Let's then secure peaceful nuclear energy. So Iran is thinking of making use of peaceful nuclear energy to provide its people with electricity in ten years for fear oil and gas will be used up. Well, we the poor Lebanese who do not know whether we have oil or gas and suffer from electricity crisis, aren't we concerned of thinking seriously for the next year, two, ten, twenty or thirty years to come? Doesn't this crisis have a radical solution? Here I want to express great expectations. I seriously call on the Lebanese government to examine and discuss a plan to build a nuclear reactor for peaceful nuclear energy to produce electricity in Lebanon. Maybe the cost of such a project is less by far than the four-year-plan. I confess again I am not an expert. Perhaps a nuclear reactor might provide all of Lebanon with electricity. We might also sell Syria, Cyprus, Turkey, Jordan and others. Its cost might be less than the four-year-plan. I do not know. Why aren't we ambitious? Why are we to move always on coal? Why are not we allowed to think of nuclear power? If we have ambitions, we will reach our goals. The issue of water is easier by far and its costs are less because we have water. Electricity needs fuel, gas or nuclear power. But as for water, we have water. We are a country rich in water. But unfortunately our water runs to the sea or goes deep into earth. Simply, we may build a number of dams and collect this water. As the region is heading towards a water crisis, the issue of water if taken seriously might solve not only the water crisis in Lebanon but water will be in the future among the most important state resources because water would be far more costly than oil. The whole region is heading towards a water crisis. Strategic experts say that one of the most important reasons for wars in the future will be water and the need for water. We have water. So we must build dams to collect this water and address the crisis of water in the country. If time comes when we are able to sell water we will sell water. As we want to dig in the sea to extract oil and gas to cover for our debts, time will come when the worth of water will be more than the worth of gas and oil. This issue does not need strategic experts and complex plans. It might rather be settled in a couple of sessions. Decisions would be taken. A number of projects would be set, and several dams would be built. We may address our national crisis as such because we are really heading towards a crisis. However, we may come to have water, dams, electricity and power producing factories whether from gas or from nuclear power. We are in fact a special, beautiful and exceptional country. This country has wealth and capacities and what is more important that its beauty, capabilities and wealth, is its pride, honor and high head. All of that needs strength to be preserved. We return back to strength, to the army-people-resistance balance which we must call the golden formula that protects Lebanon. We thank your kind attendance. We thank your precious support, love and backing for us especially at this stage. May Allah grant you success. Peace be upon you and Allah's mercy and blessing. Comment: I have suspected for a long time already that Syria is deeply infiltrated by Israeli agents. In particular, I am quite certain that the murder of Imad Mugniyeh could not have occurred without top level Syrian accomplices (I wrote about it here). The situation in Lebanon must be even worse. Sibel Edmonds and Peter B Collins have interviewed Ray McGovern for their (excellent) podcast The Boiling Frogs. They touch on a number of interesting topics, including a very good discussion between Sibel and Ray on whether the Wikileak's "Afghan Diary" papers are a real leak, or a carefully crafted "intox" by the US government. For whatever its worth, I am inclined to agree with Ray McGovern and consider that the leaks are real and not some "intox" leak. As for the anti-Iranian language used in these documents, I have a very basic explanation. Remember that these documents are supposed to have been written by US soldiers in Afghanistan. It makes them look "informed" and "politically correct" if they see a "mullah" behind each and every event taking place, in particular when a scapegoat is needed to explain the daily US FUBARs and SNAFUs in the field. Besides, people usually believe their own propaganda so if the grunts on the ground in Afghanistan see "dark hand of Iran" behind all their failures, that is not surprizing at all. Sill, Sibel asks some very good questions and she might be right. He is not neutral, of course; he is pro-Israeli, no ands ifs or buts. When one of them does not agree with the policy of that country, that too is not done halfway. For my aim, it is important to know the thinking that guides the main political and military leaders of that State. I feel that I have the authority to have an opinion because I have never been anti-Semitic and I share with him a profound hatred of Nazi-Fascism and the genocide perpetrated against children, women and men, young or aged Jews against whom Hitler, the Gestapo and the Nazis took out their hatred against that people. For the same reason, I abhor the crimes committed by the fascist government of Netanyahu which kills children, women and men, young and old in the Gaza Strip and on the West Bank. In his illustrated article “The Point of No Return” that will be printed in The Atlantic journal in September 2010, now available on the Internet, Jeffrey Goldberg starts his more than 40-page paper; I am taking the essential ideas from it in order to enlighten the readers. “If the Israelis reach the firm conclusion that Obama will not, under any circumstances, launch a strike on Iran, then the countdown will begin for a unilateral Israeli attack. Jeffrey Goldberg goes on for several pages to tell the story of Netanyahu’s father, Ben-Zion, whom he considers to be the most outstanding historian in the world on the subject of the Spanish Inquisition and other important merits, and who recently celebrated his 100th birthday. At the end of this part of his article, Goldberg carries on with the analysis of the complex situation. At times he is rather tough analyzing a 2001commentary by the former president of Iran, Hashemi-Rafsanjani, in which he is certainly speaking about a bomb that would destroy Israel; a threat that was criticized even by the left-wing forces that are Netanyahu’s enemies. ““You’d create a great sea change in the balance of power in our area,” he went on. “…in the event of a unilateral Israeli strike on Iran, his mission would be to combat Hezbollah rocket forces. […]to keep Hezbollah in reserve until Iran can cross the nuclear threshold. “When I asked Peres what he thought of Netanyahu’s effort to make Israel’s case to the Obama administration, he responded […]his country should know its place, and that it was up to the American president, and only the American president, to decide in the end how best to safeguard the future of the West. The story was about his mentor, David Ben-Gurion.